Engineering microrobotic systems using a bio-hybrid approach that couples synthetic micro/nanoscale components with live cells is a powerful approach to address key shortcomings of micro/nanotechnology such as providing an on-board power source, communication, and decentralized control. 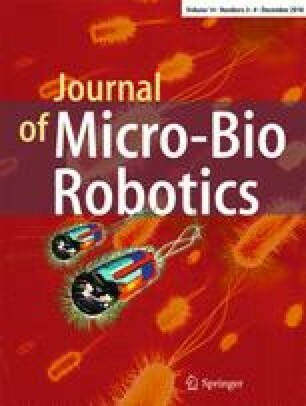 In the last decade, a number of centralized control strategies based on native biological mechanisms have been demonstrated; however, decentralized cooperative control of a swarm of bio-hybrid microrobots has rarely been explored. In this work, we use our previously developed agent-based computational model to explore the utility of integrating synthetic biology with bio-hybrid microrobotics with the goal of developing strategies for robust decentralized control of bio-hybrid microrobotic systems. To this end, our Nanoscale Bacteria-Enabled Autonomous Delivery System (NanoBEADS), wherein each agent is comprised of an Escherichia coli bacterium conjugated with an ensemble of nanoparticles, was used as a model system. We imparted bacteria with engineered biological circuits to facilitate agent-agent communication and enable predictable and robust cooperative control of a network of NanoBEADS agents. We developed a hybrid control strategy wherein a centralized chemotaxis-based control scheme is used to direct migration, and a decentralized quorum sensing (QS)-based control scheme enables the agents to independently coordinate a cooperative behavior (fluorescent protein expression). We then computationally analyzed the role of bacterial subsystem properties and spatiotemporal changes in population organization in the emergent behavior (i.e., the activation time of the QS response) of the NanoBEADS. We show that the spatial changes in NanoBEADS agents’ distribution, in response to the centralized control input, and the mass transport boundary conditions are critical factors in determining the dynamics as well as the sensitivity and robustness of the QS response. We analyze the stark differences in feasible QS parameter domains under dissimilar chemoattractant gradients and show that the flow boundary conditions may greatly influence system function. Altogether, we show that a bacteria-based bio-hybrid system must be designed with careful consideration of growth rate, chemotaxis properties, QS properties, and the environment initial and boundary conditions in the context of its target application. This modeling framework can serve as an insightful tool for the predictive design of bio-hybrid microrobotic swarms with a tunable and robust response. The authors wish to thank Pedro Ivo Guimarães Braga da Silva and Prof. Ryan Senger of Virginia Tech (VT) for assistance with the construction of genetic circuits, Prof. Birgit Scharf of VT for providing the motile E. coli MG1655, and former lab member Dr. SeungBeum Suh for assistance with C++ coding. This work was supported in part by the National Science Foundation (IIS-117519 and CAREER award, CBET-1454226).